TCR100IB reader is a classic rugged, portable electronic data collection unit. With a simple touch, you can access information by touching iButton which has memory chip housed in small, water-resistant, stainless steel case. TCR100IB reader is a classic rugged, portable electronic data collection unit. With a simple touch, you can access information by touching iButton which has memory chip housed in small, water-resistant, stainless steel case. 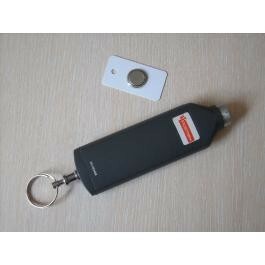 It works like electronic label through which the reader is able to read the information and store the data. The TCR100IB reader's rugged durability and real-time internal clock make it ideal for applications such as guard tours, time & attendance monitoring, or incident report & meter reading etc.. Convenient search and practical use with computerized patrol activity data. TCB-100IB Downloader Station provide the communications link between the TCB-100IB reader and the computer. With available communication speed of up to 19200 baud read, downloading a TCB-100IB reader to your computer takes only a few seconds. The patrolling guard takes the reader and touches his own Guard ID to identify himself with the system. The guard will then proceed to the designated stations and touch the installed station iButtons accordingly. The data and time will be recorded in the reader for every station touching. After patrolling, the guard will hand it over to the supervisor who will upload patrolling data to software via downloader station and have a data analysis and management.